Poultry is a good source of protein in our diets and the versatility of the meat makes for a huge variety of recipes. Chicken, and particularly turkey, are low calorie meats. With fattier poultry, like duck and goose, prick the skin before roasting on a rack to allow a lot of the excess fat to run out during cooking. When roasting a whole bird remember to: rinse the cavity with cold water and dry the bird with paper towels, completely thaw frozen poultry before cooking and make sure stuffing is cold before use. This recipe has a flavour of the Middle East, using dried fruits and spices. It has a low calorie 180 per serving. Remove all the skin and any fat from the chicken. Pour the stock and orange juice into a flameproof casserole, add the spices and stir. Add the dried fruit and bring slowly to the boil, stirring continuously. Add the chicken quarters and season to taste. Baste the chicken pieces with the liquid. Lower the heat, cover the pan with a tightly fitting lid, then simmer very gently for 30-35 minutes, until chicken is tender. Lift the lid occasionally and stir the chicken and fruit to ensure even cooking. Taste, season and serve immediately with rice or potatoes and a green salad. This turkey recipe is a very low calorie 155 per serving but looks delicious on the plate for a special meal. Heat the oven to Gas mark 5 (190 degrees Celsius. Thin escalopes of turkey are best for this recipe but you can use turkey breast slices. Flatten the turkey between two pieces of cling film with a wooden meat mallet or rolling pin. Season the escalopes.Wash the spinach thoroughly, remove the stalks and cook in a little salted boiling water for 3 minutes until just tender. Drain in a sieve, pressing out the liquid. Chop spinach finely and place in a bowl.Deseed the pepper, blanch in boiling salted water for 1 minute, drain and finely dice. Add to the spinach, with the crushed garlic and pine nuts. Season to taste. Divide the mixture into four and spread over the turkey pieces to within 5mm of the edges. Roll each piece up and place, cut edges down, in an ovenproof dish. Dot each one with a little butter and bake in the oven for 30 minutes, basting occasionally. Remove and serve immediately with hot, crisp vegetables. The preparation of the duck keeps the calories down to 310 per serving. Serve it with a selection of crisp, freshly cooked vegetables. Heat the oven to Gas mark 5 (190 degrees Celsius. Wash the duck and trim away any excess fat. Place on a wire rack over a roasting tin and prick all over with a fork. Brush the duck with soy sauce, sprinkle over the sugar and season with pepper. Cook in the oven, basting occasionally, for 50-60 minutes, until the meat juices run clear when a skewer is inserted to the thickest part. Core the apples and cut each into six wedges. Place in a bowl and mix with lemon juice and honey. Transfer to a small roasting tin, add a few bay leaves and season. Cook alongside the duck, basting occasionally, for 20-25 minutes until tender. Discard the bay leaves. For the sauce, place the apricots in a blender or food processor, with the apricot juice and the sherry. Process for a few seconds until smooth. Just before serving, heat the puree in a pan. 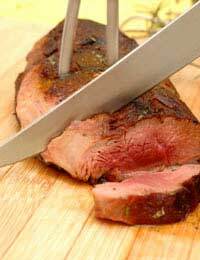 Remove the skin from the duck and pat the flesh with kitchen paper to absorb any fat. Serve the duck with the apple wedges, apricot sauce and vegetables.